The Graves Mountain Lodge Restaurant is open to our guests and the public for Breakfast, Lunch and Dinner meals while the lodge is open. Our rustic dining area is also the perfect place for special occasions such as receptions, anniversaries, reunions and birthdays. Reservations are required. We have set menus for each meal, special menu requests are available for banquets and groups. 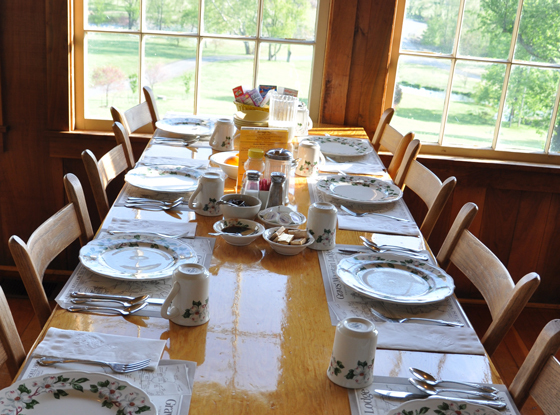 Meals are served family style except for our buffets on Saturday dinner and Sunday lunch and dinner . All meals are ALL-YOU-CAN EAT. Meal Plans are available with our accommodations. Call today for more details or to make reservations: 540-923-4231. Our Seafood Buffet includes: Steamed Crab Legs, Steamed Shrimp, Fried Shrimp, Sautéed Scallops, Salmon, Flounder, Fried Clam Strips, Steamed Clams, Fried Oysters, Baked Chicken & MORE. $35.95 per person, Children ages 6-14 are half price, Children ages 5 & under are FREE. Seafood Dates for 2019 – March 20, April 10, May 8 & May 29(Special Date), June 12, July 10, August 14, September 11, October 9, November 13, December TBD. Sausage, Srapple, Sausage Gravy, Bacon, Pancakes, Toast, Fruits, Grits, Assorted Pastries and more! $12.95/per person, Children ages 6-14 are half price, Children ages 5 & under are FREE. Big Breakfast Dates for 2019 – March 23, April 27, May 25, June 22, July 27(Peach Day), August 24, September 28, October 26, November 23, December 7(with Santa). Children ages 6-14 are half price, Children ages 5 & under are FREE.